On Monday, December 10th Positively Caviar, Inc. executed their 1st annual Holiday Happy Hour Toy Drive at the new Broccoli Bar in Washington D.C. Through joining forces with The Women’s Wing Organization, Positively Caviar had the opportunity to donate gifts to kids whose parents are incarcerated or not in the home in the Washington D.C. metropolitan area. More than 5 million children, or 1 in 14, in the U.S. have had a parent in state or federal prison at some point in their lives, according to the Casey Foundation. With the help of friends, family and supporters more than $1,000 were raised in gift cards, toys, and cash donations. All donations went toward gifts for the annual holiday party hosted by Women’s Wing Organization. This year we were able to provide gifts to over 1000 children to help them celebrate the season and bring joy to kids that are less fortunate this holiday season. “It was an extraordinary experience having the opportunity to play Santa for less privileged kids this holiday season” Chief Program Officer, Shayma Sulaiman. “We’re excited to continue these efforts next holiday season”. Positively Caviar is thankful for the many generous gifts, gift cards and monetary donations. Help continue to #spreadthePos & change the lives of people within your community. Please visit staybasedandpositive.com to find out more about Positively Caviar, Inc. or to find out how you can support the mission. 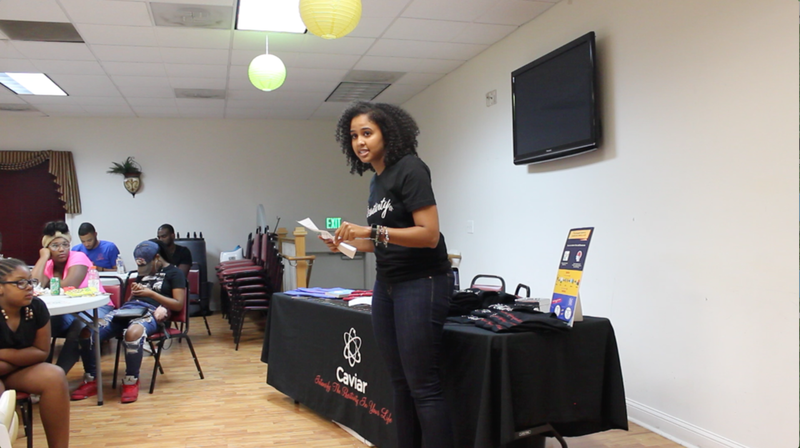 Baltimore, MD (November 10, 2018) - On Saturday, November 10th Positively Caviar, Inc. joined forces with Charm City Love, Inc. to facilitate a Wellness Weekend at the SAGE Center of Episcopal Housing Corporation in Baltimore, MD. During this time both organizations were able to help families in the Family Recovery Program transform into their healthiest self! The Family Recovery Program is a non-profit that seeks to reunite families whose children have been placed in court ordered foster care due to substance abuse issues. in order to participate in the Family Recovery Program, families are required to attend a variety of classes and group meetings to ensure that they remain drug and alcohol free and that they develop the life skills necessary to become fully self-supporting. During Wellness Weekend, Positively Caviar coordinated a B.U.I.L.D (Being Unique Individuals by Learning and Developing) workshop at the “Kid’s Center” with about 13 participants. Team members and volunteers had the opportunity to instill mental resilience into the youth with activities/discussions which include: The Power of Yet, Growth Mindset vs. Fixed Mindset, the importance of gratitude, and self-love. The session ended with a mediation session amongst all families in attendance. On May 22, 2018, Positively Caviar, Inc. teamed up with the Boys in the Good organization for a powerful speaking engagement/workshop. Young boys at Randallstown Elementary School in Baltimore, MD had the opportunity to participate in an informal workshop centered on the importance of optimism. "BOYS in the GOOD" is an after-school youth leadership program that helps boys develop new attitudes, behaviors, and ambitions while recognizing the importance of dressing well and being respectful. Boys participate in weekly character education workshops, community service and a number of enrichment opportunities. The purpose of this program is to inspire young men in grades 3 through 5 to reach their fullest potential both academically and socially. All boys serve as leaders of the school community and work each day to fulfill the aims of Giving, Optimism, Originality, and Determination. Positively Caviar Founder, Chazz Scott, had the chance to inspire and empower the young boys by speaking to the science of positive thinking, the relationship between the conscious and subconscious mind, and the process of erasing old habits & gaining new ones. “The kids were so engaged and excited”, Chazz proclaimed. “It’s a necessity that kids of this age understand this material now rather than later. It can have huge benefits over the course their lives on their habits, choices, and ultimately of their destiny. As Frederick Douglass said: "It is easier to build strong children than to repair broken men." At the end of the program, the young men were handed the signature “Stay Positive” wristbands in an effort to actually actively apply affirmations as a technique to overcome challenges. These wristbands serve as a reminder to individuals to Stay Positive during times of adversity. Boys were extremely engaged and eager to learn more about how to sustain optimism throughout their lives. Positively Caviar hopes to conduct a continuation of these workshops with the Boys in the Good in the near future.